The first 150 pages or so had me sitting almost biting my nails in suspense wondering what would happen next (or rather when something would happen finally). However, I have to admit that early black-and-white photography portraying serious people in rigid postures and unsmiling faces creep me out no matter what. There might have been a horror movie or two that I watched at too young an age. Anyway, fuelled by this little sepia-phobia of mine I read on expecting some big horrific moment to take me by surprise on turning every other page. Somewhere in the back of my mind a little voice reminded me that this novel was marketed as YA and that things probably wouldn’t get hat bad. And they didn’t. Not one bit. Which was a bit of a letdown. The whole suspenseful exposition just somehow petered out, turning into regular YA: Baby X-Men stuck in time loop for own safety no longer so very safe have to face threats or die trying. 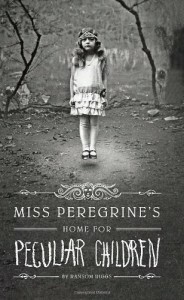 When the peculiar children leave their home and go to the village –also situated in their time loop- to wreak havoc and to practise their superpowers or skills or peculiarities or whatever, even at the expense of villagers getting hurt, they justify this behaviour with the time loop’s resetting every 24 hours. They claim that everything would be back to the start and the villagers would not even remember what happened the day before, because that day has in their loopy reality not yet come to pass. For the peculiar children every day is 3 September 1940 and they remember everything they’ve done on every one of these September 3. They get to keep their memories whereas the villagers don’t remember a thing. BUT: Just because the peculiar kids relive the same day over and over and never go beyond 3 September 1940, that doesn’t mean that life won’t go on for the villagers, with a broken arm or a burnt-down house, does it? Each timeline might somehow be continued for those outside Miss Peregrine’s home. Otherwise the villagers would just be props and that would be, well, lame. So just because these children didn’t have to see or even face the consequences of their actions they believed that no one else would be affected and everything would be peachy. I don’t quite buy that.